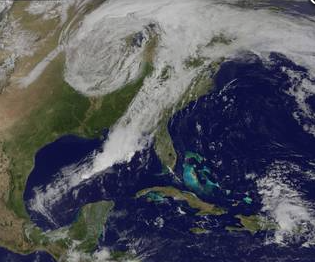 NASA and NOAA satellites have bee tracking a severe storm system in the US. A vigorous weather system has generated severe weather over the mid-section of the US and satellites are providing a look at it as it is moving toward the East Coast. NASA and NOAA satellites have been tracking a storm system that has generated flooding and tornadic thunderstorms in the central US and is expected bring severe weather to the US Mid-Atlantic region. At NASA's Goddard Space Flight Center in Greenbelt, Maryland, data from NOAA's GOES-East satellite were used to create images and an animation of the movement of the powerful storm. 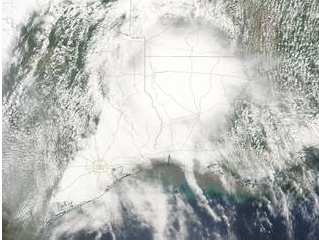 On April 30, the Moderate Resolution Imaging Spectroradiometer, or MODIS, instrument aboard NASA's Aqua satellite captured a visible image of the storms moving over eastern Texas and Louisiana. Tornadoes in eastern Texas killed four people. The system generated heavy rainfall and caused additional fatalities and damages in Arkansas, Missouri, Mississippi, Alabama and Tennessee. "Major to record flooding will continue over portions of eastern Oklahoma, northern Arkansas, Missouri, Illinois and Indiana. Rivers will gradually recede over the next several days. Additional strong to severe thunderstorms will be possible Monday afternoon and evening over portions of the Mid-Atlantic and Northeast US Damaging winds, large hail, and isolated tornadoes will be possible." On May 1 at 10:37 a.m. EDT (1437 UTC) NOAA's GOES-East satellite captured a visible image of the storm system centered over Iowa that showed its associated cold front that stretched into the Gulf of Mexico. That system is expected to bring some severe weather and heavy rainfall from New York state all the way to Florida on May 1. On May 1 at 10:37 a.m. EDT (1437 UTC) NOAA's GOES-East satellite captured a visible image of the storm system centered over Iowa that showed its associated cold front that stretched into the Gulf of Mexico. That system is expected to bring some severe weather and heavy rainfall from New York state all the way to Florida on May 1.